Every decision that we make has an impact on our lives, and sometimes simply speaking up about what we believe is right can have devastating consequences. Unexpected medical bills can be the result of taking a stand, which may ultimately lead to bankruptcy without some financial assistance. Fortunately, DonationTo is dedicated to helping people raise money online. As an added bonus, we offer many tools and educational resources to enable you to avoid the most common donation website mistakes. Our platform was designed for simplicity so that everyone can use it, and our partnership with PayPal and WePay makes online payment processing a breeze. On March 26, 2015, Samuel Ayres was riding his motorcycle to work when a chance encounter changed his life. In California, it is illegal for motorists to be on their phone while they are driving, but it is legal for motorcycle operators to ride between lanes. While at a stop light, Samuel noticed a guy in a BMW texting instead of paying attention to the road. Deciding to take a stand, Samuel told the man to get off of his phone while driving. Unfortunately, this caused the BMW driver to get angry enough to follow Samuel. A few block later, Samuel was sideswiped and the BMW drove away. Because this understandably became a criminal investigation, Samuel was blocked from immediately seeking funding through a lawsuit. 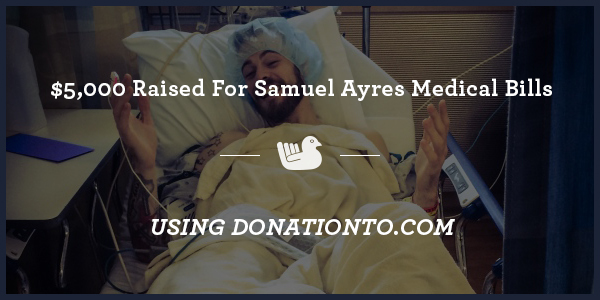 Insurance was not nearly enough to cover all of Samuel’s medical expenses, so he started an online fundraiser in the hopes of collecting $5,000. The campaign exceeded this goal, and Samuel has since recovered and been able to get back on his motorcycle. We understand that people who are going through a serious medical crisis need help meeting their immediate financial needs, but it is also important to remember the emotional aspects of their situation. Due to this, we created a comments feature that gives each donor the ability to post some words of support. Motorcycle accidents happen more frequently than passenger car incidents, and the rate of fatalities is also much higher. In fact, someone who is involved in an accident while on a motorcycle is 26 times more likely to pass away as a result of their injuries. These crashes are most commonly caused by head-on collisions and cars making left-hand turns. Unfortunately, this shows a lack of awareness on the part of many passenger vehicle drivers, and it is often the motorcyclist who ends up paying the ultimate price. Medical fundraising is a prime way to help cover the unexpected expenses that are associated with a motorcycle accident. However, it is necessary to avoid falling into one of the numerous crowdfunding mistakes. For instance, many people believe that they can make a page and then stop paying attention to it. This may raise some money, but you will have a much better chance of meeting your goal if you share the fundraiser via social media and send email updates about it to all of your contacts. DonationTo has built-in features that will help you do both these things. Being in any type of traffic accident can cause a large amount of injuries and medical bills, but motorcycle riders definitely have the highest risk factor. Samuel ended up dealing with a long recovery process and many medical issues as the result of an angry driver who purposefully sideswiped him. Although this definitely complicated Samuel’s life, the good news is that he was able to gather more than $5,000 by turning to our online fundraising platform. Anyone can launch a crowdfunding page in less than five minutes. You do not need to have any special technical skills or previous experience. We offer all of the tools you will need to promote your cause, including a one click email feature and a social media integration tool. You can also take advantage of our virtual library of tips and tricks to ensure that you do not make any common fundraising mistakes.